Toyota Motors (Pvt.) Limited Quetta Balochistan. Applications are solicited from bright, educated & experienced persons possessing Initiative, Drive to achieve, customer friendly approach and desirous of working in a modem business environment are welcomed to apply. 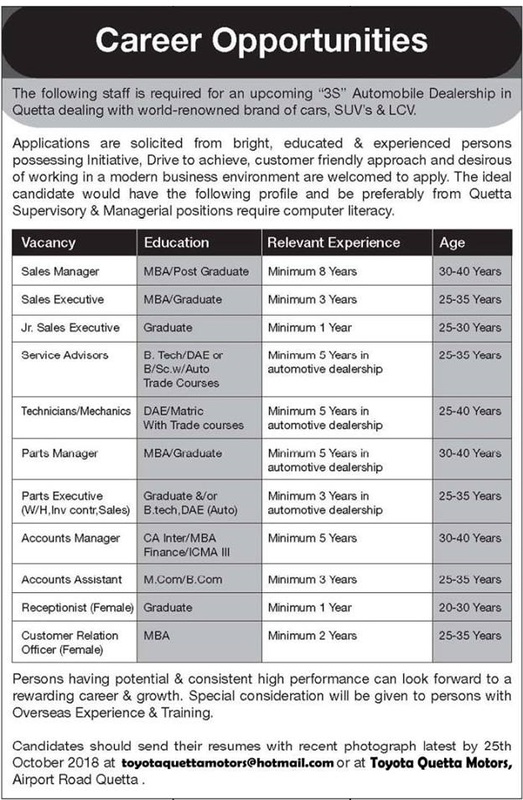 The ideal candidate would have the following profile and be preferably from Quetta Supervisory & Managerial positions require computer literacy. Persons having potential & consistent high performance can look forward to a rewarding career & growth. Special consideration will be given to persons with Overseas Experience & Training. Candidates should send their resumes with recent photograph latest by 25th October 2018 at toyotaquettamotors@hotmail.com or at Toyota Quetta Motors, Airport Road Quetta.